Double Dragon 3 original NES Nintendo Game cartridge only - Cleaned Tested and Guaranteed to Work! I've played this game as a kid and still enjoy it as i do now double dragon was one of my favs im glad that lukie games are able to provide such classics and at a great price!! have this got it don't recommend it . u get killed easy with no continues horrible replay value! 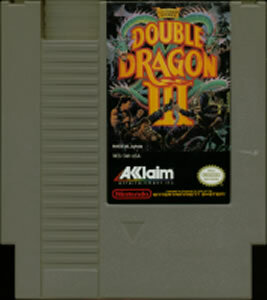 Double Dragon III is definitely the weakest of the NES Double Dragon trilogy, but that by no means makes it a bad game. It's still a great game, but the first game is better for a single player experience, and the second game is better for a co-op game. 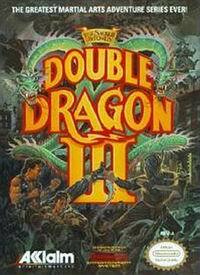 Well alot of people would say that this is not the best double dragon game but, I would have to diagree with them. and I'll tell you why.So DD1 and DD2 were a hit,and with DD3 there is some changes and I'm glad that they did with this one.It still has it's Double dragon formula,"beat'em up kicks, punches,knees,weapons...story line graffics and stages but it also has new fetures like running, jump throw, longer use of weapons, characters,new weapons,more action... this game is alot harder to master but not impossible...you only get one life and you can take alot of damage to your energy bar.There is actually a continue in the middle of the game and when you beat the first couple of bosses they come along with you to help you along the way.You can switch between them and you(Billy).The first time you play this game it can get the best of you.I like the challege in this game and it's jam packed hyped up action a nice end to the nes Double Dragon series...enjoy!!! 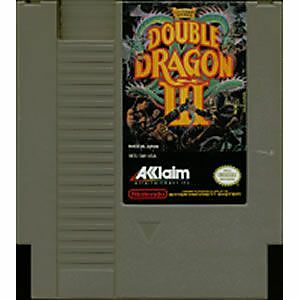 Double Dragon III is a beat 'em up game by Acclaim. Double Dragon is a classic series, but this entry is by far the weakest. Aside from some translation errors in the script, DD3 seems like it's a good game at first. Unfortunately though, the gameplay is more tedious than the previous entries, and the difficulty is insane. One death means game-over; no continues, no saves, no extra lives. Even with 2 players you will find yourself shutting this one off not too long after powering up your poor NES.